Green Thai curry with fried tofu chunks. If you can't get this, try getting the mince. Tofu - Chinese supermarket quantity of roughly three slabs of 2" square by 1.5" deep. 1 onion or, you can use a few shallots instead. ones. Get healthy-looking stems like these. In a pan, put the rice and boil it according to the instructions. In another pan, put the jeera and some oil and fry until it starts to brown. Add the coriander powder and fry that. Put to one side. 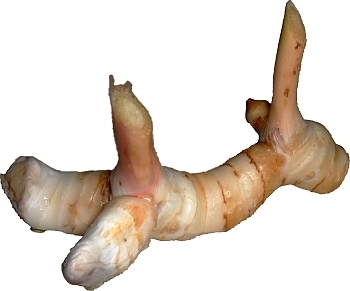 Grate 2" of galangal - note that this removes the fibres from it so they won't get stuck between your teeth. Top, tail and chop up the lemon grass. You are aiming for pieces around 2mm big. Top, tail and chop up the 12 chillies. 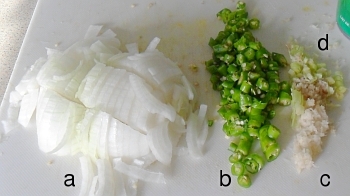 c) grated galangal; and, d) chopped lemongrass. Chop up the onion, or, if you are using spring onions, remember that most of the flavour of a spring onion is in the green part so just chop 1/2" off the top and nip the bottom off, before chopping up into pieces around 5mm long. frozen, the flavour is locked in. Cop up the lime leaves into small bits. 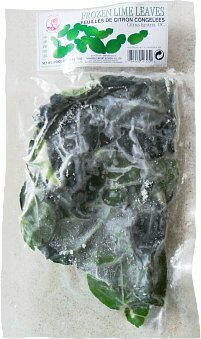 Some people prefer to leave them in whole and then remove them after cooking - frozen Kaffir lime leaves are quite strong so you might decide that you want to do that as well. Reheat the pot and put in galangal and lemongrass and fry for around half a minute or so. Then add the chillies and fry for about another minute. Add the onion and the garlic and fry. When the oil is absorbed, add around 100mls water, put the lid on and let it cook until the onion is soft. While it is doing that, add the basil, coriander and lime leaves to it. 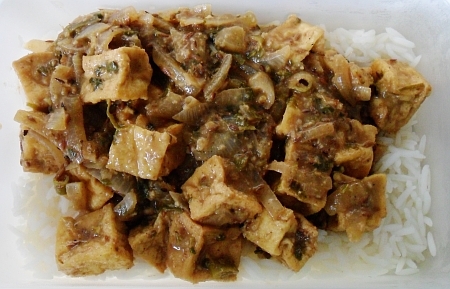 Drain and then wash the tofu and then chop it up into roughly 1.5cm cubes. Put the deep oil fryer on at 180 Celsius. Whilst that is warming up, the onions in the curry should be soft by now. To the curry, add the coconut milk and the lemon juice. Put the lid back on with a low heat under it. 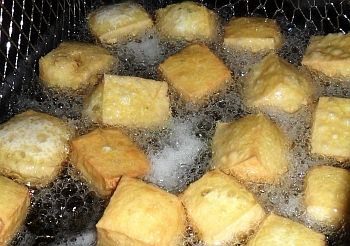 One block at a time (18 cubes in this example) lower the cubes into the oil, taking care not to splash too much. 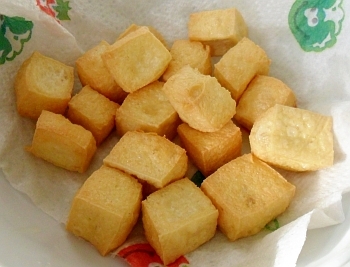 Fry the cubes, agitating them so that they self-turn - use a fork for any that are reluctant. on some paper kitchen towel. Once they are brown, tip them out onto some paper kitchen towel to mop up any spare oil. Add them to the curry mix and put the next batch into the fryer, repeating until complete. Divide the rice into the three lunchboxes and then divide the thai curry into them, ensuring that they each have roughly the same number of tofu cubes. sauce and serve on a bed of rice.